Removal ProcedureRaise and support the vehicle. Refer toLifting and Jacking the Vehicle.Drain the engine oil and remove the oil filter. Refer toEngine Oil and Oil Filter Replacement.Remove the catalytic converter. 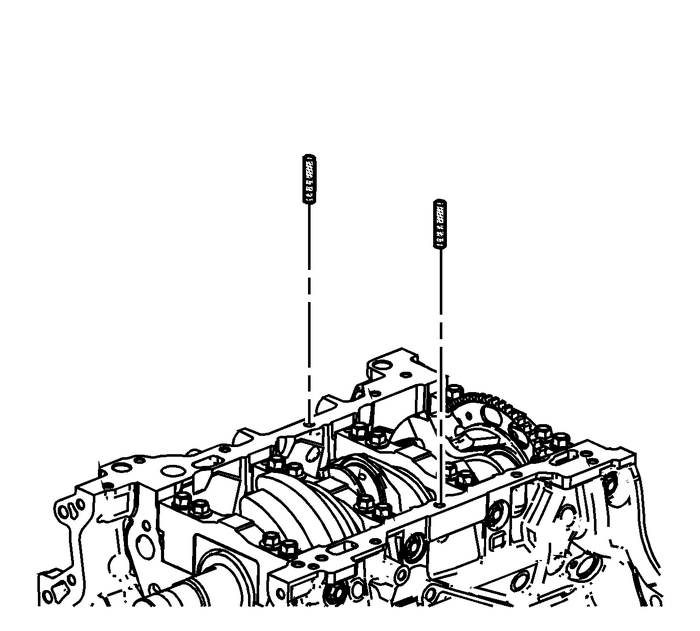 Refer toCatalytic Converter Replacement - Left Side.Remove the air conditioning (A/C) compressor bolts and reposition. DO NOT dischargethe A/C system. Support the A/C compressor. 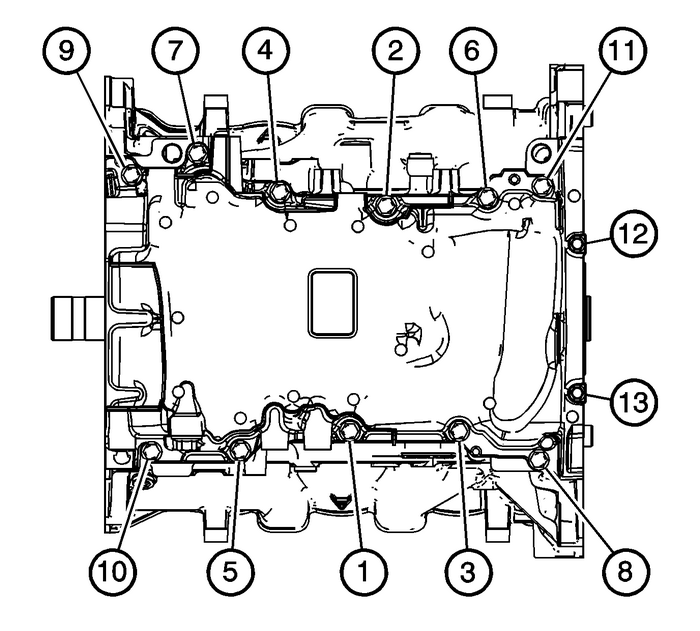 Refer toAir Conditioning Compressor Replacement.Remove the front cover. Refer toEngine Front Cover Replacement.Remove the oil pan to transmission bolts. Install the 8-mm (0.315-in) guides from the EN-46109 setinto the center oil pan rail bolt hole on each side of the engine block. Place a 3-mm (0.118-in) bead-(1) of RTV sealant , on the block pan rail and the crankshaftrear oil seal housing. Position the oil pan onto the block. 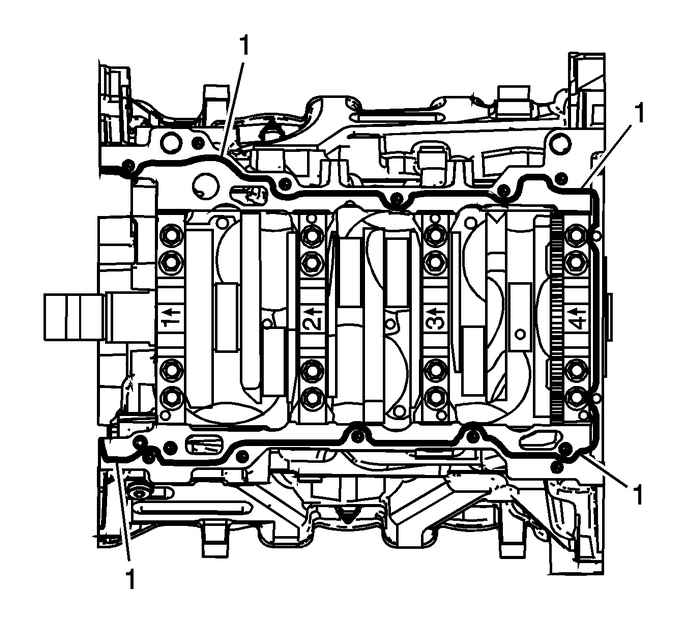 Remove the EN-46109 set8-mm (0.315-in) guides from the engine block. Loosely install the oil pan bolts. 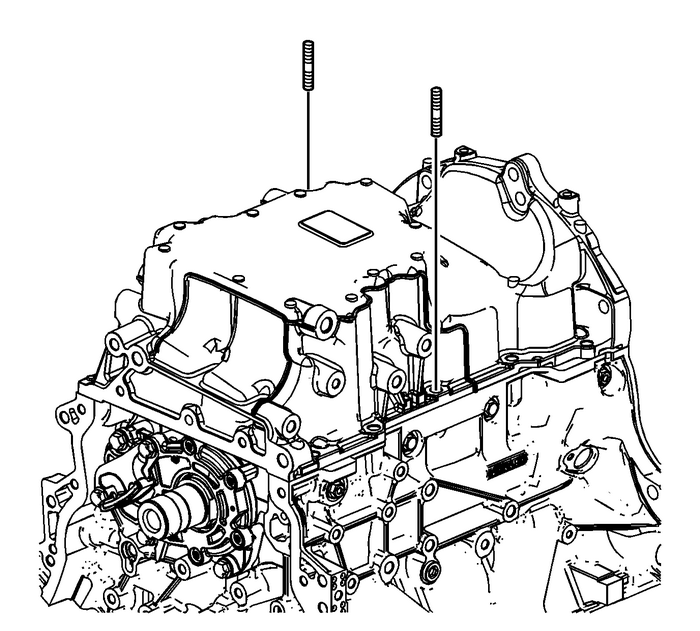 Tighten the oil pan bolts in sequence.The 8-mm bolts-(1–11) to 25-Y (18-lb-ft).The 6-mm bolts-(12, 13) to 10-Y (89-lb-in).Install engine front cover. 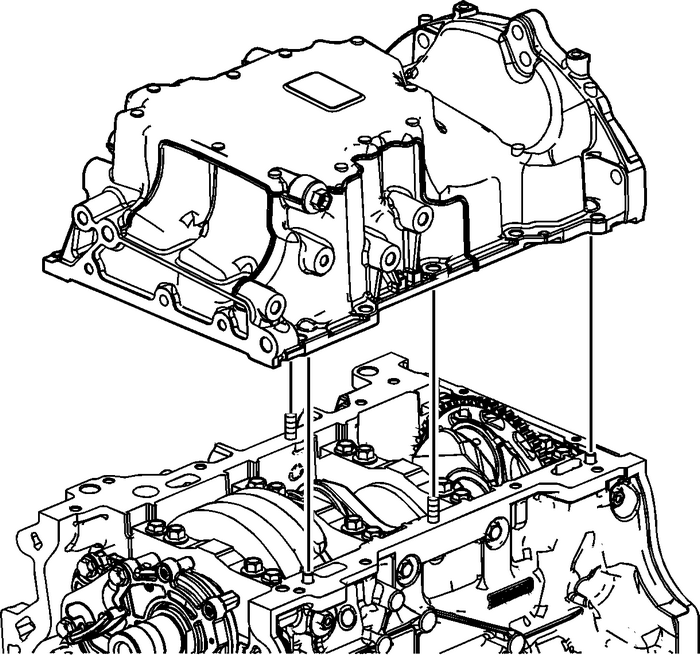 Refer toEngine Front Cover Replacement.Reposition the air conditioning (A/C) compressor and install the bolts. 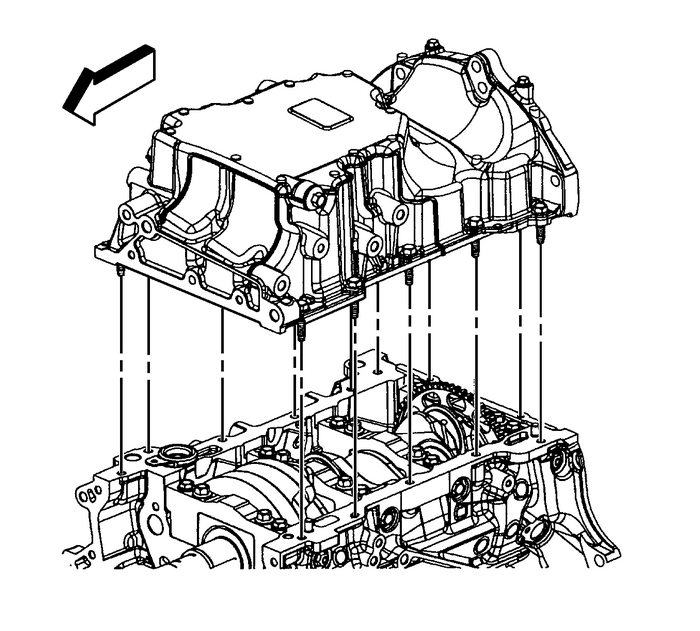 Refer toAir Conditioning Compressor Replacement.Install the catalytic converter. 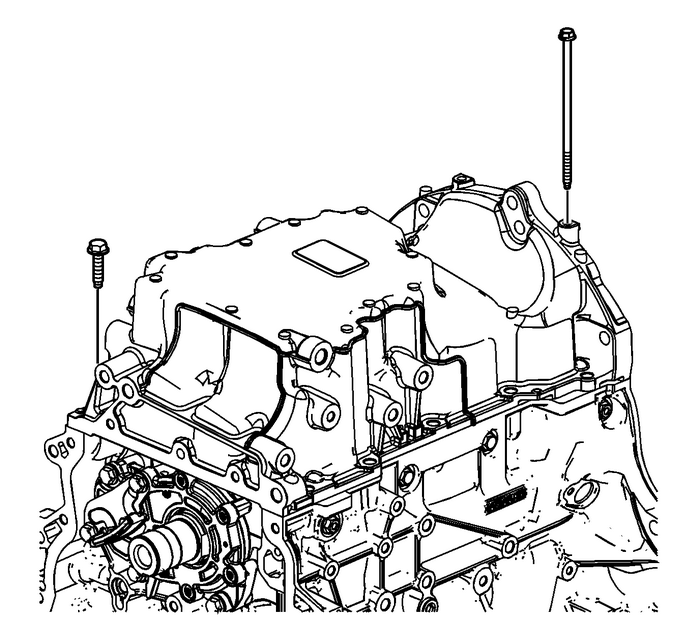 Refer toCatalytic Converter Replacement - Left Side.Lower the vehicle. Refer toLifting and Jacking the Vehicle.Refill the engine oil. Refer toEngine Oil and Oil Filter Replacement.